For the first time in five weeks, Syracuse fell into a big hole and could not fight back, getting nearly run out of the gym at #7 Louisville on Sunday afternoon, 88-68. The Orange (17-13, 9-8 ACC) took a four-point lead at the midpoint of the first half, but the Cardinals (23-6, 11-5) roared back with a 23-4 run to take a commanding lead. SU simply lacked enough in the tank to come back, never getting the gap to single digits. The entire game is one which Syracuse will likely choose to forget, as they shot under 36 percent for the game, including under 28 percent on three-pointers, while the Cards were a collective hot hand, making just shy of 58 percent of their field goals, including 45 percent from deep. Louisville also owned a 39-28 advantage on the glass and outscored the Orange in the paint, 38-22. SU started slowly on offense, falling in an 11-2 hole over the first three-plus minutes as they failed to make a field goal. Tyus Battle added a free throw to the SU side of the ledger, then was the first Syracuse player to connect from the field when he stepped into a three-pointer from just right of the top of the key with just over five-and-a-half minutes gone. 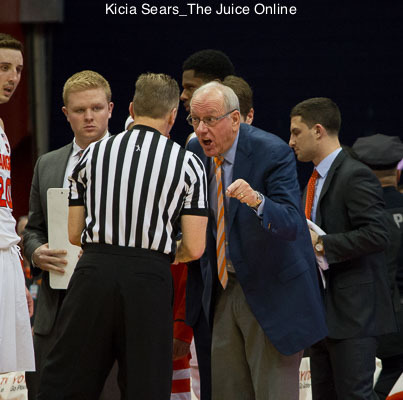 The Cardinals struck back with a jump shot, then their offense went into the cooler while the Orange heated up. Louisville missed five shots and turned the ball over five times as SU rattled off 11 straight points. Tyler Lydon opened the run by banking in a three-ball while trailing in transition. Battle then took over, starting off with a floater from the right side of the key. On the next possession, Battle rattled home a triple from just off the right corner to put Syracuse in front, then added another triple from the right wing two trips later to give the Orange a 17-13 lead. That four-point lead was the high-water mark of the day for SU as the Cardinals roared back with a 23-4 run. The run was bookended with bursts of eight and nine points, the latter boosting Louisville to a 36-21 lead with under four minutes left in the opening half. Lydon scored twice in the closing minutes of the half, but the Cards added five points to offset those markers and held a 41-25 halftime lead. 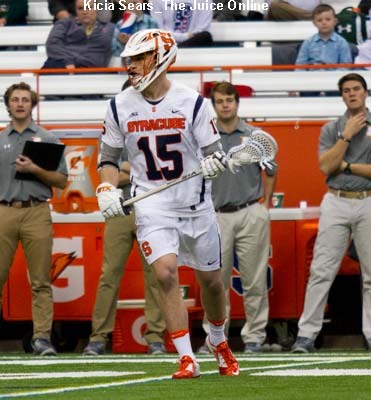 The start of the second half made things even worse for Syracuse, as the hosts tacked on seven more points coming out of the locker room to push their lead to 23 points. The Orange scored to stop the bleeding, but Louisville responded with their own bucket. SU ran up eight straight points to eat into the gap. Taurean Thompson drove the left side of the lane for a basket and foul, adding the free throw for a three-point play. Lydon dropped in a pair from the stripe, then John Gillon buried a three from deep on the left wing to draw Syracuse within 50-35 less than four minutes into the half. The Cardinals responded by pushing their lead back out to 19 points on three separate occasions, then the Orange made another run, posting seven straight points. Gillon opened the run with a pair of foul shots, then poked the ball from a Cardinal and closed the ensuing Orange possession by swishing a three from the right wing. Lydon then followed a miss with a one-handed jam and SU trailed, 60-48, with 11:31 left on the clock. Andrew White III would drop in a lay-up to chip the margin down to 11 points a couple minutes later, but Louisville needed little more than three minutes to hang a 12-4 run to take a 73-54 lead with under six minutes to play. White III would get SU within 15 points later on a corner three, but the Cards brought their fans to their feet with a pair of treys and an alley-oop to take an 86-63 lead with just over a minute left and walked home from there. Tyus Battle topped the Orange with 20 points, rolling up 14 in the first half. Tyler Lydon posted a double-double, finishing the day with 17 points and ten rebounds, while also grabbing three steals. Taurean Thompson scored nine of his 11 points after halftime and John Gillon had all ten of his points after intermission. Donovan Mitchell led all scorers with 25 points and did a lot of damage from deep, bombing in six triples. Ray Spalding had a big day, as well, finishing with 18 points and 11 boards. Deng Adel added 17 points, including 13 in the second half, while Quentin Snider chipped in with a dozen. Anas Mahmoud did a little of everything for Louisville, finishing with eight points, nine rebounds, and four steals. 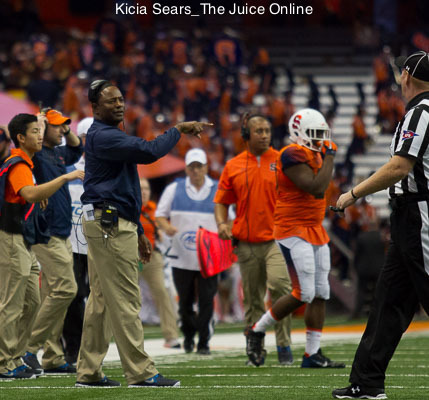 SU has several days off before their regular season finale on Saturday when Georgia Tech visits the Carrier Dome. The Yellow Jackets (16-13, 7-9), who look to finish a season sweep of the Orange after beating them a week ago, are firmly on the NCAA Tournament bubble with the Orange. GT’s Ben Lammers was a force in the first matchup, ringing up a game-high 23 points and seven blocked shots. Tadric Jackson added 20 points off the bench, nearly twice his average on the season. Taurean Thompson paced Syracuse with 18 points and a dozen rebounds while Andrew White III had 17 points. The game, which will be the last appearance at the Dome for DaJuan Coleman, John Gillon, Tyler Roberson, and Andrew White III, will be televised regionally by the ACC Network with tip-off set for 4:00pm Eastern. The game will also be online at ESPN3.com.